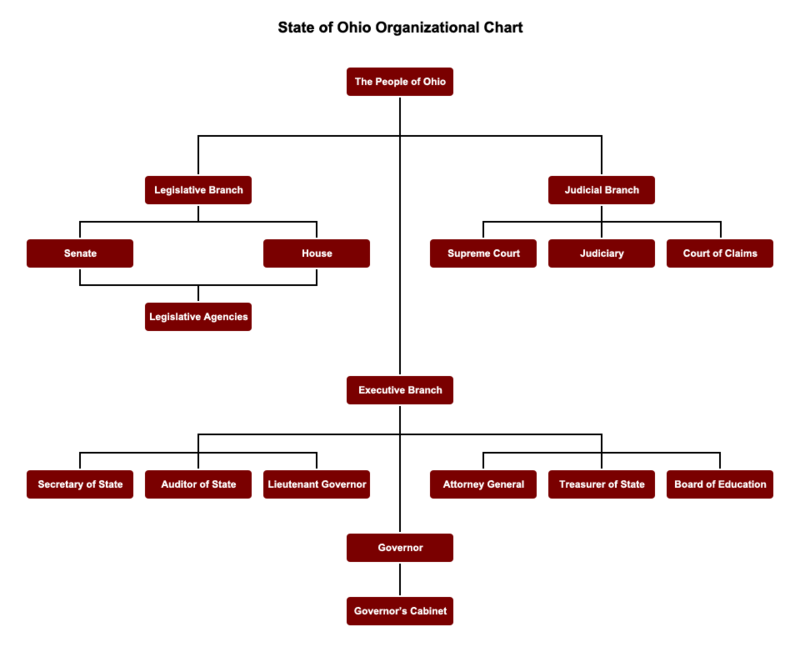 Ohio's state government contains three branches: executive, legislative and judicial. The Executive branch includes the Governor, Lieutenant Governor, Secretary of State, Auditor of State, Attorney General, Treasurer of State, State Board of Education and the Governor's Cabinet. The Cabinet members serve as directors for the many state agencies and are appointed by the Governor. The Legislative branch consists of the House of Representatives and the Senate. Together, these bodies are referred to as "The General Assembly." Ohio's House of Representatives has 99 members; the Senate has 33. The Legislative Service Commission, a staff of trained legal experts and personnel, drafts proposals for new laws and law changes, is one of several legislative agencies that are also part of the Legislative branch of Ohio's state government. The Judicial branch comprises the Ohio Supreme Court; numerous judiciary bodies--including 12 courts of appeals, courts of common pleas in each county, municipal courts, and many county courts; and the Court of Claims. Creating new laws and changing old ones is one of the most important functions of state government. Any proposal for a new law or for changing an existing law must begin as a bill in Ohio's General Assembly. Most bills require a majority vote in both the Senate and the House of Representatives to pass. Emergency measures require a two-thirds majority; constitutional amendments must receive a three-fifths majority to be placed before the voters. If a bill passes in both chambers, it is then presented to the Governor to be signed. The Governor has 10 days to sign or veto a bill. If signed, the bill becomes law. If vetoed, the bill is sent back to the General Assembly. At this point the bill can only become law if at least three-fifths of the legislators vote to override the Governor's veto. A bill can also become law if the Governor fails to take any action on it within 10 days.